H.L. Enloe’s ORMA 60 wins Division 0 and establishes a new multihull mark. HONOLULU — There’s no debating Mighty Merloe’s record-breaking finish in this year’s Transpac race will be one for the ages. What is left for debate is whether the new multihull mark for fastest Transpac time will be mentioned alongside other seemingly unbreakable competitive sport records, such as Cal Ripken, Jr.’s consecutive games played streak or the Boston Celtics’ run of 11 championships in 13 years. H.L. Enloe’s Mighty Merloe, a trimaran, reached Honolulu’s Diamond Head a full day ahead of the previous record finish for a multihull, giving her first-place honors in Division 0. Transpac acknowledged her record finish in a July 10 post on Twitter. “CONGRATS to #MightyMerloe for smashing the course record by a whole day and coming in first place under Division 0!! #Transpac #transpac17,” the Transpac July 10 tweet stated. Mighty Merloe’s finish eclipsed the previous record set by Explorer in 1997; Explorer finished Transpac 1997 in 5 days, 9 hours, 18 minutes and 26 seconds. This year’s Transpac featured 55 entries, most of which were about halfway between San Pedro and Honolulu when Mighty Merloe crossed the finish line. 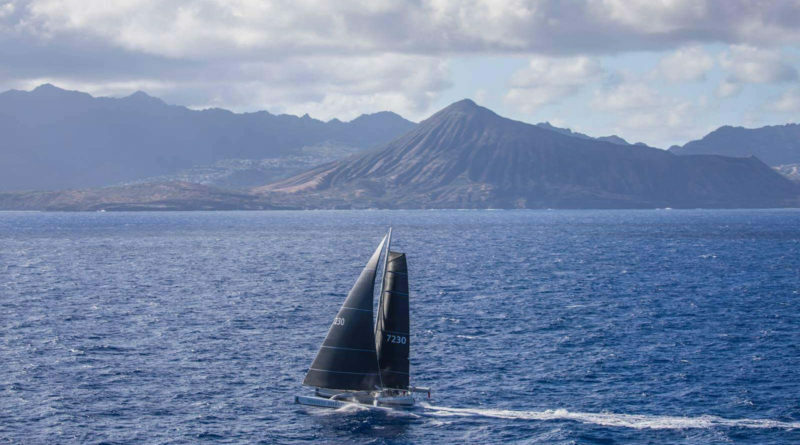 The biennial Transpac race features sailors competing across the Pacific Ocean, with the 2,225-mile course starting in San Pedro and ending at Honolulu’s Diamond Head. Sailing conditions were quite favorable this year, according to organizers. Mighty Merloe was built in 2004 and is based at Silver Gate Yacht Club in San Diego. Visit thelog.com for expanded coverage of Transpac 2017 (including official finish times). Congratulations, Mighty Merloe! Well done! Party on!